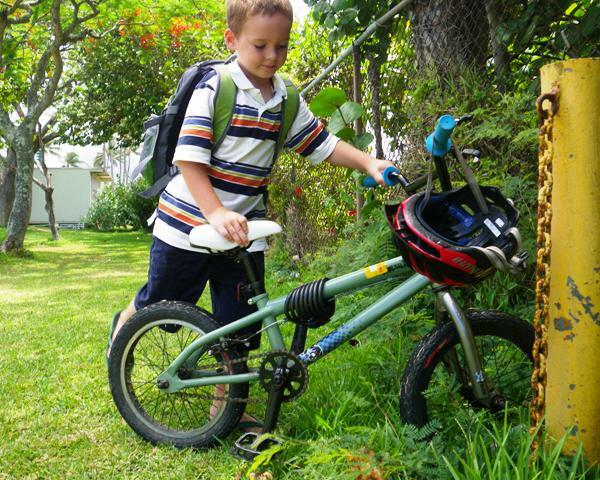 Sam locking his bike up in the morning before school. Being the only kindergartener riding a bike to school has its challenges, but plenty of rewards, too. We get to chat for longer on the way over, we get our blood moving, and sometimes we have a few laughs over crazy spaz-outs (like almost running over a huge trash can, or getting a flat tire, or seeing a huge family of ducks out grazing). We have gotten to know our crossing guard, Anne Marie, who is maybe 70 and just as cute as can be – thin, graceful, sweet, immaculate in her bright yellow rain jacket and stop sign. She looks the picture of health, probably has tea and toast in the morning, sends the kids off with a “have a great day!” and then hikes the tallest ridges. That’s my guess. I hope I am like her when I’m grown up. In other news the campus has gone nut-free – yes, they found me out! no more nuts on campus! After expressing my concerns from a public health policy standpoint (see NY and MA guidance on managing allergens on campus) I began collecting suggestions for healthy nut-free lunches and providing them to the PTA president for her newsletter. I bought Sam a bento box and filled it up with healthy food in the classic Japanese 4:3:2:1 ratio (rice:meat:vegetable:dessert). It was a great way to think outside the lunchbox, so in a way I’m grateful for the somewhat misdirected ban, and of course empathetic to the challenges the kids with severe allergies face. Sam is adjusting very well to school and relishes telling me every day who is chasing who on the playground, who got knocked over in the chase, who jumped out from behind the playground equipment, who got their name on the board (Sam did once so far for imitating a drumming noise the class troublemaker was making), and other classroom news. He is now unlocking his bike himself and walking it to the turnout area where all the parents pick up their kids. We are the only yellow Xterra, so we’re easy to find (we look like a school bus!) and the other day Ben and I turned up on our bike to ride home with Sam. That was fun. Sam is such a grown-up guy, and I am very proud of him. All the concerns people have about preschooling their kids so they are able to adjust to school I think are overrated. A bit of care and attention is all it took to prepare Sam, and he had no tears until today when his bike lock would not cooperate when I arrived to pick him up. Poor guy. Daddy had a bad day, too, leaving his ID at home by accident then found his check engine light on after already spending $1200 on a new clutch. Oy. Hoping the car was just having a bad day. I called to him from way across the field as he was running toward me, and when he arrived I suggested he try to calm down, give it one more go, just being sure the numbers were all lined up with the knobbies and right-side up. I watched from 100 yards away as he went back at it, and ultimately prevailed. I was SO proud of him! (I couldn’t easily leave to rescue him as Ben was in the truck and car upon car was trying to get around us to collect their kid(s).) There is a whole band of guys (junior police officers) who stand with little helmets on to help the kids get in their cars. They have whistles, they open car doors, they hold out stop signs to let people cross, they signal the line of cars to advance to get the next batch of kids. It’s quite impressive. Bento box lunch! 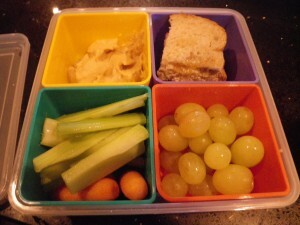 Carbs (whole grain omega-3 fortified bread with yogurt spread and honey); hummus; veggies; fruit; and Hershey's kisses (not shown). Great stories. Time between posts is not a worry – I just keep re-reading the last post and gawking at pictures. Have fun off the grid.